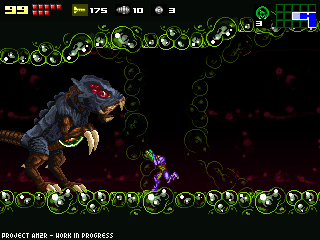 - The caves between Areas 3 and 4 that had 2 Metroid fights will be slightly expanded and themed as a mining facility. Most of the assets are already produced and in place. This enhances a lot an otherwise dull area, with little time and effort. - The new area, the submerged temple, will not be accesible at launch. On the planned first release, the game will feature the original contents. This will save a lot of time, since there's still a lot of unifinished features in that area, that can be completed after an initial release. - The main tunnel will feature only one mix of the main song. Music production is prioritized for more important tracks right now, but other/s mix/es might be added in future updates. - Additional features like extra color pallettes for the surface area (day cycle), achievements and bonus contents will be pushed back for a future update. There's a lot of features that were already pushed back. I am aware of how delayed the game already is, and how people are losing interest in the game over time. Prioritizing things this way will be better for all of us. About this month's progress, there's one more control feature that has been partially implemented and will be revealed as soon as the remaining assets are produced. Debugging that, and polishing the scripted events were the focus of development this month. It's not much, I know, but hopefully the changes in piorities and scope of the whole project might change the development pace for the better. I thank you all for your patience and your support. How can people LOSE interest in this project ? Me, I'm even more hyped at every news you post here, because each news is a step towards completion ! And now you says that realease is to be soon(ish)? How can we NOT be hyped and excited about this ! Thank you again for all the work you did on this. I'm really eager to see what the final product will be ! Thanks for the post. It's awesome that you're taking steps to get the game out sooner, but this is an awesome project and I appreciate the time and effort you are putting into polishing it. I for one will happily wait as long as it takes for the release, it looks like it's going to be fantastic once it's done. I AM NOT LOSING INTEREST IN THIS GAME OVER TIME. In fact, I get MORE AND MORE HYPED BY THE SECOND. Even if I am the only one (and I highly doubt that), I'll still be here to play this game when it's released. Whenever it is. AND I'LL COME BACK FOR THE UPDATES. Don't feel yourself under pressure due to release the game, just because of fear people will loose interest in your project. I was getting aware of tbis project in 2009 and I'm still very excited to see every new glimpse you are giving to us once in a while. It is a great project and I'm really looking forward to play a new release. Nevertheless you may change, or at least revise, your thought of changing/exclude the game features which where originaly planed. Why? Because including this planned features you would build up a phantastic package of gameplay with a lot of athmosphere and replay value. Don't get me wrong, even without these additions the game, surely, will get great but the anounced additions like achievments, unlockables, etc.freaked me out, in a positive way, as I heard of it. So I was a bit dissapointed as I had to read about the exclusion. I don't like that you're delaying features like an entire area. Once you release the full game, people WILL lose interest after the excitement fades away. Please don't diminish the first playthrough experience simply because a few impatient people are demanding the game now. I can wait plenty longer, and they can too. But I suppose you've made up your mind now. Also, any chance AM2R will appear at the upcoming NCFC, even if it's just past content? You're the best, Doctor. Don't undercut your efforts by rushing. Don't feel bad about the delay! I haven't lost interest, neither have other people. In fact, I think the project's gained more recognition thanks to Youtubers and other videogame websites that have acknowledged it! I'm looking forward to playing it when it's launched! You're almost there, so don't give up yet! We're in this together with ya for the long haul. Yeah don't worry about taking a long time to finish! Keep up the great work! You're doing a lot better than me who is kind of considering starting making apps, but never actually get started because I'm too busy playing video games and reading comics to actually start working on anything, heh. "Losing interest"? This will separate the true fans from the fakers. We, the true fans, will NEVAH forsake you! Don´t worry making a good game is not the easiest thing, so take your time. This is going to be so awesome! Keep on working on it, we're with you all the way! Keep up the amazing work, I am with the rest of your fans here that there is no need to rush. Every update does keeps us all hyped for a grand final remake. My interest in this game is still as strong as ever. I was worried for a moment when there wasn't a progress update for almost a whole second month, but I'm glad it's still alive in your heart. I'm going to publicize the crap out of it when it releases. Losing interest? On my favorite Metroid game? Yah right, I check this blog practically twice a day, just to see if there is an update; each day I grow more, and more anxious for it to come out. You are doing great, Maybe we can have a "Christmas present" and have a new demo of it, Just for further progression to see if we can find any more bugs. Granted bugs will be found; and will need to be fix, but this way with so many people playing, chances are finding one will be better than having 20 people play and not finding one. I would wait another 5 years for this game if need be. I cannot wait to play this, and thank you for undertaking this venture in the first place. I actually keep coming back to your guys' website about once a week as I have it bookmarked, just so I can be able to catch the latest update! Don't dare think that you've lost my interest in seeing this project getting closer and closer towards completion! We've already came a long way now and I will continue to lend my voice and thoughts for you guys, even if development would take two more years to get this game finished and very polished.. it will be worth the wait just so everyone can be able to experience your fantastic fan-game for many generations to come! Why would I lose interest in the only new Metroid game I have any news about? Awesome ! We'll get a chance to get used to the original areas once again before exploring the new areas but with propper looks and all the new cool stuff. Don't worry about time Doc, there's plenty of it. Updates on the site are good enough. As long as you are working on it it's perfectly fine. People still haven't lost interest in playing Half-Life 2: Episode Three and we don't even know if Valve's even working on it, take your time, knowing it this game will be done some day is far more than what valve gave us, not to menion Metroid Confrontation and the Demo. With the bitter taste Other M left us with, we're all looking forward to your awesome work of art. I'm probably in the minority that want this game being released as complete as possible. I mean if I run through the game on first release, does that mean I have to go through the game again when new content is added. I have been waiting for a long time so and I can wait some more. I check the site every day, and was pleased to see an update. Look forward to its completion, and the extra features sound promising, yet while still preserving the original in the first release, is a great idea! I think this is a bold move doc and I support it completely. Please finish the game promptly having the first version as reflective as the original as you can (such as so no gravity suit at all). After it gains widespread media success then you can blow people's minds with new original content. Im so excited for the first release of the full game! Keep going! Who cares of others are losing interest that's their loss, they get to miss such an awesome game! I'm a huge metroid fan, and I can't wait to see how great it'll turn out ! Lol this game will never be finished just like every other fangame they always stop working on them..
O bien, al menos, crear una versión con sonidos originales o semejantes al Metroid II. Me gusta el proyecto y lo sigo desde sus inicios, y no me gustaría encontrarme con que este Metroid tiene todo menos la esencia del Metroid II (valga la redundancia). Ojalá tome en cuenta esta acotación, que viene de un fans antiguo y que sigue su proyecto con anhelo y deseando que sea cada vez más entretenido. dude nonononononono no. dont cut the stuff out. we can wait patiently for awhile longer. Keep it up! I'll never lose interest! After all, I've been following this project for over 2 years now! I can't wait for the full release, and keep up the good work! Doc, people aren't losing interest of course! But when you post something like "new control options" (when current ones are almost perfect) of course there are much less comments than if you post something about new areas or light effects. I'm visiting your blog since 2009 and I'm very excited about every update! Doc, just keep working, everything is fine! IMO the worst thing you an do is release a raw product. Then people may lose interest, and worse.. You may lose interest after release! I'm professional softare developer and I know what I'm talking about. If a raw product is released and came to so called "tech support stage" it can never be smething good. It will be raw forever. So Doc, just make it done when it's done and we will wait. Just provide us with interesting blog updates =) Thank you for that great work you're doing for us! If you wanna make some Christmas gift for us, just make some updates to the Demo. I would NEVER lose interest in this project. Well unless you said flat out that you where dropping it whole sale. But I do like the idea that your going to release basically the core experience and then give us little extra tid bits that just add to it later on. It's going to make it just that much more re-playable. While it is true that delays for this game make me a little sad. I am still as hopeful and excited as ever to play this someday. I also understand real life likes to get in the way of things and I can wait as long as needed. All the more so i can wait even longer if I need not fear that it wont reach release someday. I love this game hope all the best for it. Take all the time you need just never give up. I wish you the best of luck both in this and the rest of you troubles. you have put much work in this and easily deserve much praise over it. I really like this project and I'm glad that its still progressing regardless of speed...playing the demos have really proved how great Metroid can be especially with your skills in making this project...i hope the full game pays off really well...i can't wait to play it and will keep my patience...well done! Just because we don't always comment doesn't mean there aren't a lot of people watching. I've been subscribed to this RSS feed for a while now and I read every posting. I've been following since at least 2007, but probably since 2006. I remember the first tech demo came out a month or so before I found the blog. I still check on a regular basis for updates, even though my own life has gotten pretty crazy too. I'll never stop being excited about this game. I actually haven't played any of the demos yet (since Confrontation 2), as I don't want to spoil the final version. Honestly, this post mainly told me that I won't be playing the first full release either... I'm waiting for the complete package, and I have no problem being patient. As long as you don't put the project aside after the first release, I'm thrilled to see that a partial version will come out. It'll satiate the people who aren't as patient as me, and if you keep working afterwards I don't see it delaying the final version that I'll be waiting on. Don't worry about interest loss. There will always be people who will play the metroid games in order, PC/eumlation being the best way to do so, AMR2 will definitely take the place of Metroid 2, not matter how late it is. I can't speak for everyone, but I don't think that people are loosing interest. At least for me, with each update you post on the blog the more and more exited I get. Masterpieces are for the pacient!! Same as everyone else here, I haven't and never will lose interest in this game. I'm exited about every post you make and check back all the time. This game remake is something that I have been looking forward to for a long time and I'm willing to wait as long as it takes. Definitely not losing interest - I've been following this for a long time, I'm not about to quite now! Thanks for keeping up at it. Losing interest on the probably best Metroid game after Super Metroid, hahaha.. Doc, stop thinking stupid things. Wait, WAIT. LOSE INTEREST? They are definitely not true fans. Anyway, I'm glad to hear that the project is going strong! Keep pushing Doc, I know we won't be disappointed! I wouldn't mind another demo, maybe during christmas time? Waiting patiently more than losing interest, I think, doc. Toma tu tiempo, nadie te presiona. Si los fans pierden interés es porque nunca lo tuvieron, yo en realidad tengo y checo tu blog cada semana. I want this game so so...soooo badly. When I played the demo I said for myself that, that was one of the best metroid games I've ever played since super metroid. Keep up the good work and I will await for the next update, hopefully before christmas. I will Metroid forever! Haven't lost interest and hope that you haven't yourself. I feel like you're doing a fantastic job and I would hate to see this project take a dive towards the end. Not saying it is but don't feel pressured that you need to release it in such and such time. Hey, I've waited for a LOT of things for a long time, but at least I have a spark of hope. Ever since I followed this project back in 2008, I still have hope because at least you're flat out honest to us the subscribers, knowing if there's a good step ahead or a snag. Fair bet, I have faith that you one day brag and say that you got this out sooner than Half-[Redacted so Gabe Newell and Valve will avoid not being as pleased as the Queen of England]. Can you develop the game running on .apk file so many people who love the game can play it on their android? Siempre apoyándote hermano siempre al pendiente aunque no ande en el foro mucho! siempre ando pendiente!! mucho animo!! saludos! Hey dude, don't feel down about pushing the release date back. I don't mind at all waiting for a game that will just get better and better. Great games are made with time and polish (just look at Metroid Prime) and rushing something out because people want it NOW is never a good idea. I've played a couple of the early demos. I'm just gonna let this be until it's done, so it can be enjoyed for all it's worth. Hell, it's gonna be a little bit sad when it's done. Even if it was fanmade, it was great having a Metroid game to look forward to in the future. Now we'll probably have to wait another five years until someone reinvents the franchise again. Don't worry about lost interest! I've been following this project for over a year and a half now! Llevo siguiendo este proyecto desde hace años y aun sigo cada mes visitando la pagina para ver su desarrollo. ¡Animo! ¡No todos hemos perdido el interés! Why don't you get some help? It should be obvious you're in over your head, and I'm sure there are plenty of people that would offer their assistance for free. I've been following this project for I don't know how long now and I'm about to stop caring. It looks like it's going to take another 5 years and that's just ridiculous, it's time to stop trying to make it perfect and adding new features, and just release it already. Doctor M, my boy, It's perfectly fine that you take some time with the game. Those of us who are fans of your work will still be here waiting for it. I don't see this project going the way of Dark Biohazard so I'll still check back on it every few weeks. I still have plans to LP it, but I've chose to do a blind-ish run of it. Recien me entero de este proyecto, que la verdad anda muy pero muy bueno espero que lo logren acabar porque te agarra y t deja con las ganas de jugarlo hasta terminarlo. I've been following this project for 5 years now and yeah, I can say I keep checking your goddamn blog every month with glee. I wont ever lose interest on this, so much time waiting for it to come out I already have an strongest relationship with it than with my gf. ^^ I think it´s great to see , that you did not Gave up on it ! It's probably a little late to implement this- considering how far in development you are, plus the whole trying-to-pick-up-the-pace thing, but I think it would be nice if you had an option to toggle on/off the map before or during a playthrough. Now, I personally wouldn't be able to play any sort of MetroidVania game without a map, but I'm pretty sure there are people out there to whom the best part of Metroid on NES was making their own map on pencil and paper; and it's obviously pretty hard to do that since the game just gives one to you. Again, you're probably in a bit of a time crunch, but at least give this idea some thought. Who knows? It'll probably make the game that much better, and if it doesn't, well it's only an option. Espero que vocês consigam terminar este Remake. i suggest you all read this,its amazing! provides awesome possible lore! Listen, We've not lost interest, the last couple things you posted were just not that commentable. Many fangames have lost steam, but when the next big event happens to it, everyone starts talking about it again. It happened to SRB2, it will happen here. I will never lose interest on this project i've played 2 different demos and i must say great work putting boss fights that ain't in the original game. Those we're done nicely and they fit in well. I'm eagerly waiting the final release so i can play the whole game it's awesome game on Gameboy but this remake is heavenly. I just discovered this project today and have been pretty much raving about how awesome this is. I hope you keep working on it and upload a new demo or the finished game someday soon. I loved the demo you have, it was good work and fun as hell. I've reviewed it on my gaming blog on tumblr (I have around 140 dedicated followers) and I want to do a review of the finished product. Your work is inspiring to me. Keep up the great work. Is there a hit counter on this website? Because while I rarely comment, I check this at least once a week. Don't think anyone has lost interest, we're just waiting ;). As for this update, I would love for the game to be updated later (as well as ensuring my save file still works from version to version). It would add replay value to it as well as be exciting for us who want to see the updates. BTW, I know there are a lot of people that are just waiting for the finished product to donate. PLEASE keep it up! Nintendo hasn't put out a Metroid game in awhile, so I'm looking to you now! Please don't worry about people losing interest in this game: At the moment, people might not be that interested because it's still a work in progress, and the demos have been explored through and through.. Your dedication to this project despite all the real world conflicts is nothing short of incredible. I eagerly, yet patiently, await to see the completed game. I'm more than certain that it'll be worth the wait. Just stumbled across this site and this looks amazing. As a huge Metroid fan, take all the time you want! I just found this page via Did You Know Gaming. The demo was fantastic!! Can I do anything to help?!?!!? Donate money or something? Please let me know!!! Thanks for your development of this beloved title! It looks great!